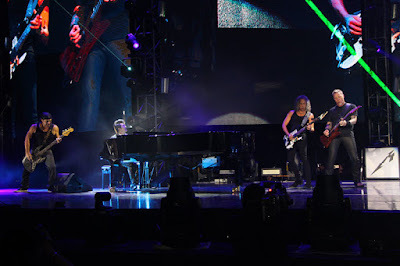 Metallica were joined by Chinese concert pianist Lang Lang for a performance of their 1989 single, “One”, during their show at LeSports Center in Beijing on January 18 and video from the event is available. Metallica will return to the Grammy stage next month to perform in sync with their nomination for the project’s lead single, “Hardwired”, in the Best Rock Song category alongside tunes by David Bowie (“Blackstar”), Radiohead (“Burn The Witch”), Twenty-One Pilots (“Heathens”) and Highly Suspect (“My Name Is Human”). "We have something very unique and special planned for this celebratory night," says the band, "so tune in to watch." The 59th annual Grammy Awards will be broadcast live from the Staples Center in Los Angeles on February 12 on CBS-TV starting at 8:00 PM EST. Following this hennemusic story, Metallica released official footage of the Lang Lang performance, which can be seen here.